This is a brand new B.C. 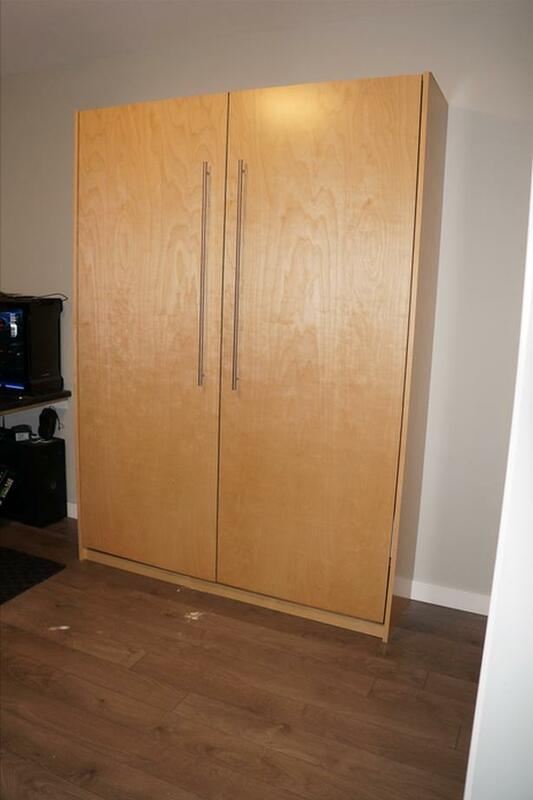 made Murphy Bed using European hardware and real wood plywood for long term beauty and reliability. We have over 25 years' experience in manufacturing these beds, and we do so with an eye to value. Other producers cut corners with melamine panels and hardware from the East - we use tried and true methods and materials to ensure your satisfaction for many years to come. A Murphy Bed is the best way to magnify and expand the space you live in. They are fast and easy to raise and lower, and will accommodate any reasonable depth of mattress, with no need for a boxspring. The example shown is a clear lacquered birch, and you may order this or an unfinished oak (which can be stained any colour for 150 extra), or a plywood core with a white plastic surface at the same price. Delivery and installation cost 200 all over Greater Vancouver. Please feel free to call or e-mail any time for further details and options.